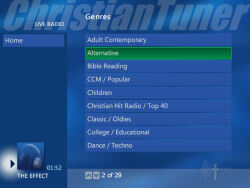 ChristianTuner for Windows Media Center is an app for Microsoft Windows Media Center that allows you to tune in to your favorite Christian radio and TV on your Windows Media Center using your television and remote control. 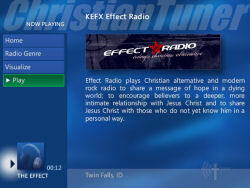 ChristianTuner MCE features dozens of live TV stations, dozens of TV programs on demand, hundreds of live radio stations, and hundreds of radio programs/podcasts on demand. ChristianTuner MCE then will show up under Extras/Extras Library (Windows 7), Online Media/Program Library (Windows Vista), or More Programs (MCE 2005). The Xbox 360 is a Windows Media Center Extender as well as a video game console. ChristianTuner MCE runs in the Media Center Extender environment. Setup ChristianTuner for Windows Media Center on Media Center as described above. Connect Xbox 360 to Internet. Connect Xbox 360 to your Windows Media Center. Start Media Center from My Xbox/Windows Media Center. Launch ChristianTuner MCE from More Programs.